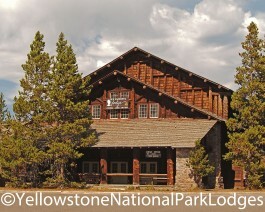 This historic cabin facility is located near Old Faithful Inn and includes a one-story main lodge built in the 1920’s featuring massive logs and stone pillars. Tremendous views of the Old Faithful Geyser can be seen from the bakery and cafeteria-style food court. The large gift store is also located in the lodge. Basic cabins are equipped with or without bath and grouped nearby. Please note that all park accommodations are non-smoking and reflecting the natural surroundings of Yellowstone; televisions, radios, air conditioning, and Internet service is not available. Wheelchair accessible accommodations are available on a limited basis.